Helen Sue Wilson was greeted by her Lord and Savior Jesus Christ on Saturday, September 26, 2015, at the age of 90. 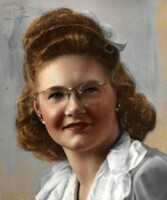 Sue was born August 20, 1925, in Tuscola, Texas, to Elmon Alfred and Ruth Mary Allen Kerby. Sue graduated Valedictorian of her class at Tuscola High School (now Jim Ned High School). She married Jimmie Lee Wilson July 21, 1946, following his service in the Army Air Corp in World War II. They had one child, David Marc Wilson, in 1953. Sue had a short stint as a beautician in De Leon before following her father and brother into the banking business. She wore many hats during her years at Farmers & Merchants Bank including the founder of the “65 Club" offering benefits to senior citizens and the “Fair Ladies” guiding tours around the world. She also served as loan officer, compliance officer, and retired as Executive Vice President at the age of 78. She was widely known in De Leon through her many years of service to the Peach and Melon Festival Committee and was a long time member of Epsilon Sigma Alpha Sorority. Sue began playing the piano at an early age and accompanied her father at church in Tuscola. Upon moving to De Leon, she was asked to become the church pianist at First Baptist Church, a post she held for almost sixty years. She also served as Sunday school teacher, bible study leader, and witness to the grace of her Lord Jesus. She was preceded in death by her parents; sister, Mary Jo Kerby; and brother, Elmon Allen Kerby. If desired, memorial contributions may be made to First Baptist Church care of the Music Ministry at 125 South Houston Street, De Leon, in memory of Sue.